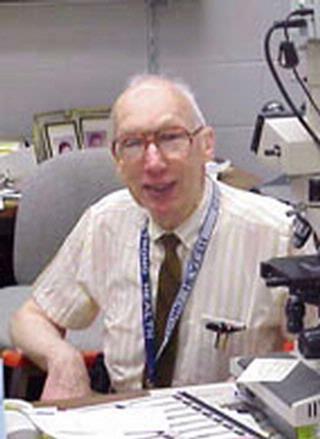 For many years, Dr. Panner has been the UR Medicine Labs expert in renal pathology. He has served as Director of the Diagnostic Renal Electron Microscopy Laboratory and of the Autopsy service. He has been recognized for his excellence in teaching and his contributions to medical student education at URMC. Dr. Panner's research interests include causes of renal dysfunction at the morphologic and molecular levels, as well as patterns of incidence of renal disease. Mansoor GA, Panner BJ, Ornt DB. "Azithromycin-induced acute interstitial nephritis." Annals of internal medicine.. 1993 Oct 1; 119(7 Pt 1):636-7. Panner BJ, Berkowitz P. "Glomerular capsular herniation in focal glomerular sclerosis." American journal of kidney diseases : the official journal of the National Kidney Foundation.. 1992 May 0; 19(5):480-3. Erturk E, Rubens DJ, Panner BJ, Cerilli JG. "Automated core biopsy of renal allografts using ultrasonic guidance." Transplantation.. 1991 Jun 0; 51(6):1311-2.